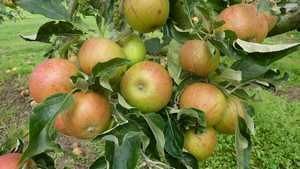 Cox's Orange Pippin - Dessert Apple Tree £15.75 - Dessert Apples - Late Season Apple Trees and Fruit Trees For Sale. Buy at competitive prices with wholesale discounts. Cox's Orange Pippin is a popular and highly esteemed English eating apple, possibly the finest dessert apple of all! Accredited in particular for its delectable flavour and attractive appearance it is an aromatic apple with a sweet and nutty flavour. The fruit is excellent for juicing and cider making and the tree is a good precocious cropper. Unfortunately it is also a tricky one to grow in certain parts of the country – it doesn’t do well in areas of high rainfall and prefers the drier south-eastern counties. 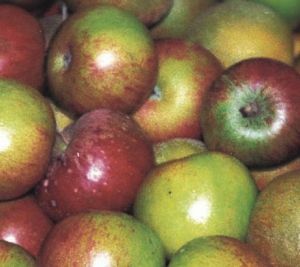 A good alternative to planting Cox in areas of higher rainfall would be Ribston Pippin or Sunset. Cox's Orange Pippin was originally grown in Colnbrook, Buckinghamshire in 1825.